Developmental Guidelines: Use from birth until baby starts trying to sit up. Developmental Benefits: Sensory- Variety of textures, sounds, overhead lights and calming vibrations stimulate baby's auditory, visual, and tactile sense. 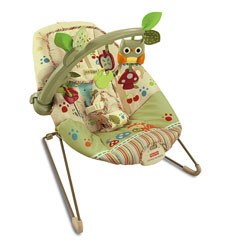 Security & Happiness- Soft seat and calming vibrations soothe baby. 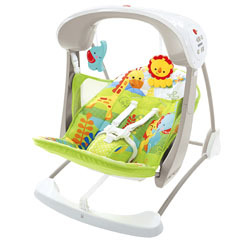 Gross Motor- Overhead toy bar encourages baby to reach and bat-at toys while kick pad encourages baby to kick strengthening gross motor skills.